Illinois' Alex Wittinger (35) jumps above her opponent to pass the ball to her teamate at the game against Michigan State on Wednesday, Feb. 24th, 2016. The Illini lost 43-71. 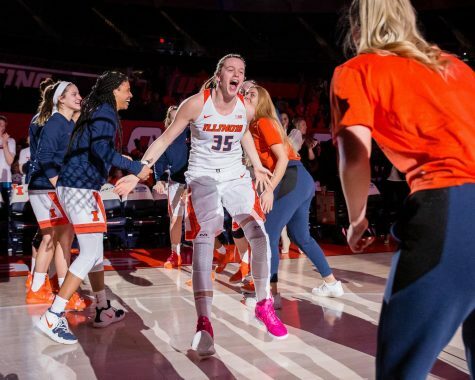 The last time the Illinois women’s basketball team won a game was Jan. 15. 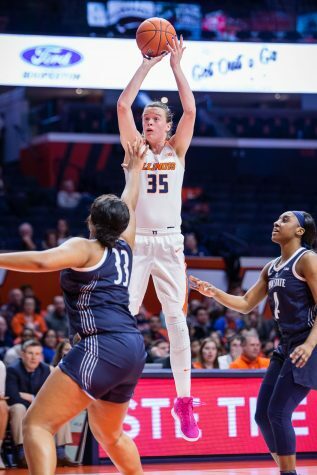 That day, the team defeated Nebraska at the State Farm Center by 20 points, behind a three-headed attack of Petra Holesinska, Brandi Beasley and Alex Wittinger, who scored 19, 17 and 17, respectively. 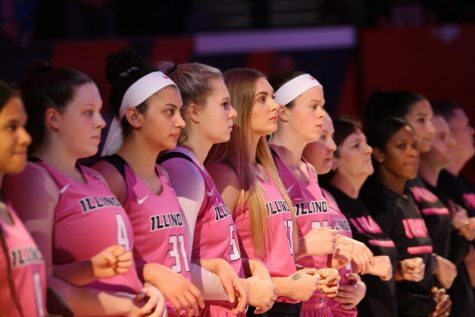 The game was the Illini’s third win in the Big Ten, and although they had yet to win two in a row in conference, 3-2 was a promising start to the conference season for the young Illini team. 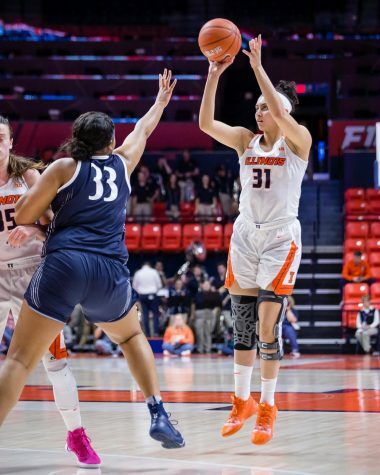 However, once the spring semester started, that promise quickly dissipated as the Illini went on to lose their final 11 games of the regular season, ending with a 74-60 loss to Indiana on Sunday. 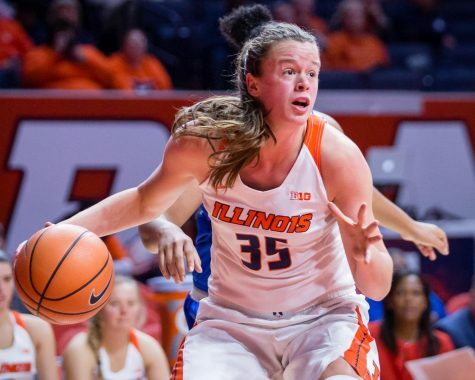 The loss to the Hoosiers locked the Illini into the 12th seed in this week’s Big Ten Tournament. The Illini open the tournament Wednesday at noon, hoping to end their losing streak against the Cornhuskers. Nebraska dealt with its own long losing streak, starting with the game in Champaign and ending eight games later against Indiana. But the Cornhuskers have won two of their last three, including an impressive 76-74 overtime win against Michigan State on Sunday. 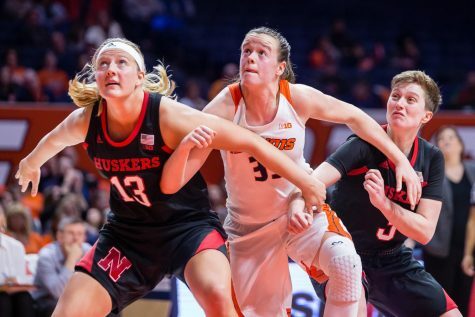 The Huskers forward Jessica Shepard scored 25 points against them in January and had a season-high 32 points on Sunday. 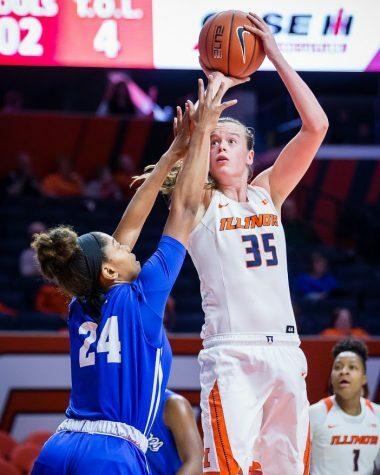 For the Illini, the big question looming over the game will be the health of Wittinger, who leads the team in scoring and rebounding. 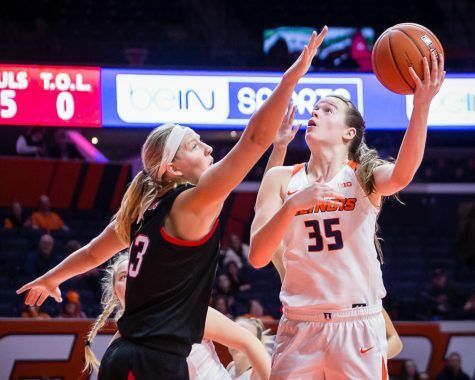 Illinois was leading Indiana on Sunday until Wittinger left the game with a pinkie injury, and her status for Wednesday’s game is still up in the air. Wittinger said that the injury was still being evaluated, and that it will be a game-time decision whether she can play. Head coach Matt Bollant reiterated that in his press conference Tuesday morning. 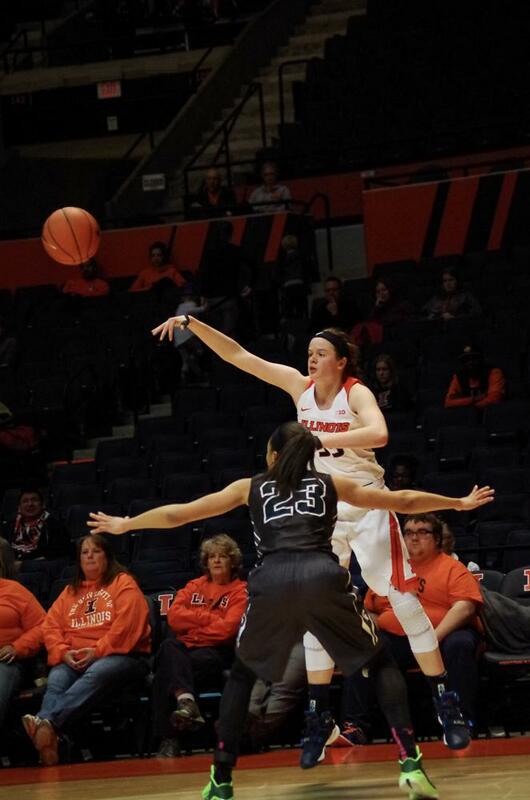 If Wittinger can’t play, the Illini will have to fill the void she’ll leave in the middle of the court. If Illinois defeats Nebraska, the team will move on to play fifth-seeded Purdue, who beat Illinois in its only matchup this season. If Nebraska wins, Illinois’ season will be over. This will be the first Big Ten Tournament for the team’s seven freshmen, and with that, Beasley admitted that there will be some initial nerves.